Felice D’Abate first appears in Fairport Harbor, Lake County, Ohio, area in 1927 or 1928. In America, Felice D’Abate was known as Felix A. D’Abate. Felice D’Abate, son of Giacomo D’Abate and Maria Felicia LaGamba, was born on July 12, 1904, at Frosolone, Italy. He married Lucia Castagna, daughter of Domenico Antonio Castagna and Maria D’Abate, in 1925. Felice died on October 15, 1965, at his home, 564 South State Street, Painesville, Lake County, Ohio, at age 61. His body was interred at Riverside Cemetery at Painesville, Lake County, Ohio. Felice D’Abate, age 17, immigrated to the United States on December 6, 1921, travelling to Morgantown, West Virginia. He was joining his brother, Nicola D’Abate. Felice D’Abate became a citizen of the United States on June 13, 1932. Felice resided at 82 Sanford Street, Painesville, Lake County, Ohio, when he was naturalized. Two of Felice D’Abate’s siblings also lived Painesville. His sister Maria Cristina D’Abate migrated to Painesville in 1921; his brother, Nicola, in the 1930’s. 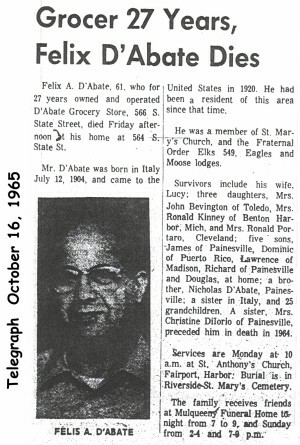 Felice owned and operated the D’Abate Grocery Store on South State Street in Painesville for 27 years.